Imagine you are a group of alien species trying to build a functioning space station with a variety of different components. This is the theme of chimera station. Players pick one of the four alien races, each with their own special advantage. Each round players will take turns placing workers to build new pieces of the space station or upgrade your workers by splicing new genetic components onto them, just make sure you can feed your workers at the end of every round. This was a game that Caroline had been looking for awhile. While the theme was interesting what really caught her eyes were the unique looking workers and the idea of splicing worker pieces together. So when we finally stumbled upon it in a LGS we bought it. The game starts with each player getting four basic workers, ten victory points, and a starting resources (as determined by the bonus resource card). The resource card will give the player some combination of money, food and genetic components to use in the game. Each player takes turns placing their workers to gather resources, buy new modules, upgrade workers, or refill the reactor. At the end of the round players must be able to feed their workers. If you are unable to feed your workers at the end of the round and have genetic enhancements you will lose one per hungry worker. If you do not have any genetic enhancements you will lose victory points. As the game progresses and the space station becomes filled with new modules players will have a greater number of options for worker placement per turn. Each module has its own unique traits and abilities and I will not go into those here but the basic places where you can put your worker either give you money, good or genetic components. It is also possible to get more workers, by playing the right modules or by increasing your research track players are able to gain more workers (but must still be able to feed them). This game is probably one of the most enjoyable worker placement games I have played. The ability to change your workers is a great twist. 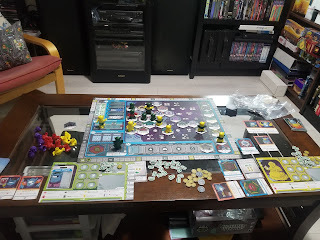 I like the setup and layout to the board and the fact that not all the space station modules are able to come out every game, this gives the game a tremendous amount of re-playability. Some of the things that could be improved are I feel like the pieces might break after a bit of use and the scoring system is sometimes daunting adding up all your points. We have played this game a few times since we bought it and the theme is great, the gameplay is fun and the worker placement twist is unique and fitting to the theme. In case you missed it, Lost Loot is having its very first contest!!! This month we are giving away a copy of Viceroy (still in shrink) to one lucky reader!!! Want to win? Like us on Facebook, Follow us on Twitter, subscribe to our blog, or comment on a blog post for a chance to win. Really like free stuff? The more you share, click, or comment the more you will be entered to win. The contest will close February 15th.